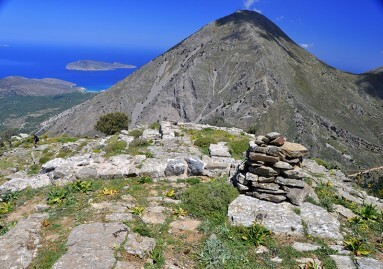 If you are a fun of hiking in Crete during your holidays on the island, probably you have already discovered the best places offered for such an activity. 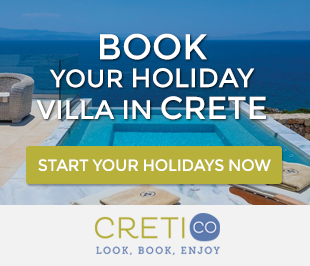 However, always, Crete may surprise you with the hidden beauties of its nature, revealed to you by taking different hiking routes every time you explore the island. 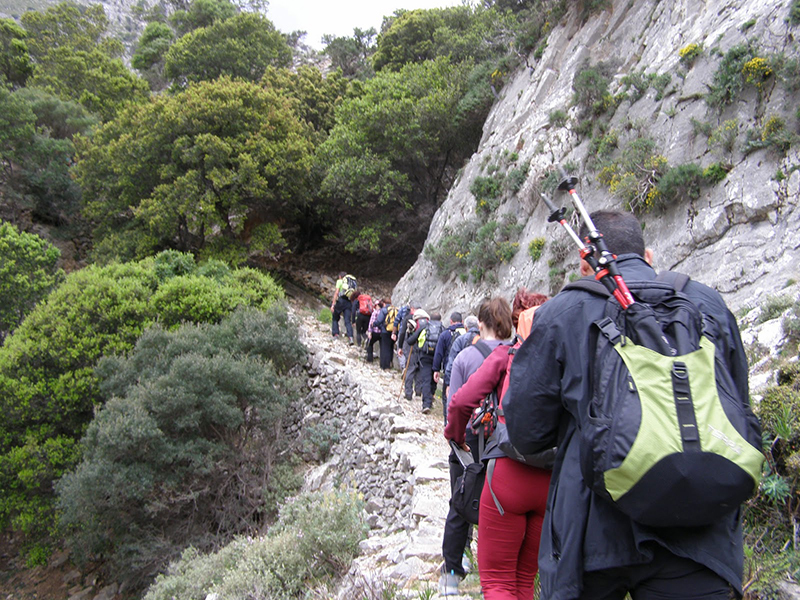 So, we present to you one of the most beautiful routes for hiking in Crete, in each eastern part: Kavousi Gorge – Platanias – Thripti – Papoura. It requires a quite good physical condition, but the route, crossing the most impressive point of the Sitia Mountains, will reward you, as it is fantastic. 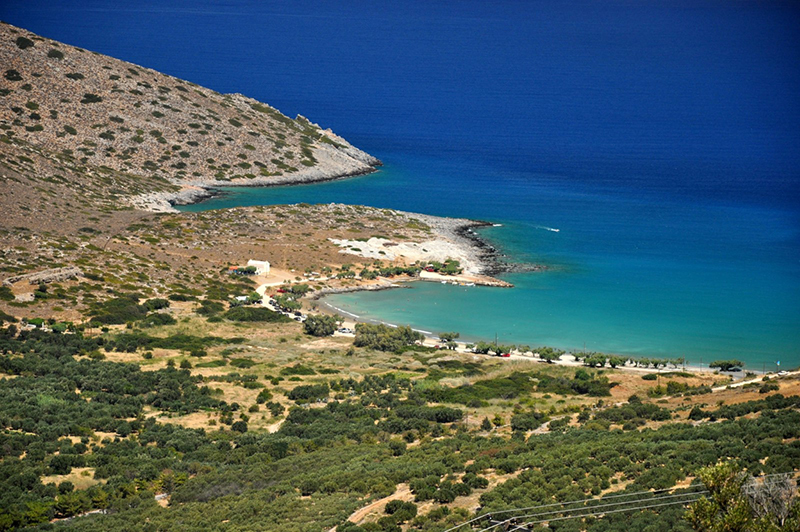 Starting from the eastern edge of Kavousi, you take the road that leads to the archaeological excavations. You pass through olive trees and about half an hour later, the road forks. You turn right, if you want to visit the excavations, or otherwise, you keep going left. 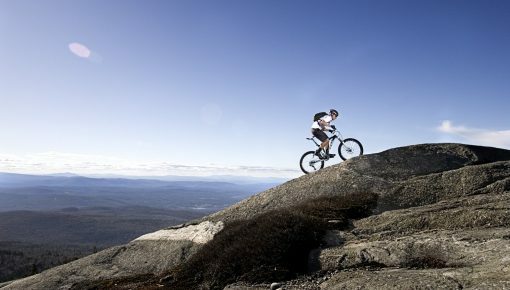 You pass a small church and, after a few minutes, you reach a mountain saddle. At the point that the road begins to descend, on your right, you will see a small concrete road going up to the hillside. Take this road and continue for approximately 200 meters. Soon, on your left, you will see an open concrete water pipe. Leave the road, get closer to the drain and start walking to the east, along the pipeline. At first, the path is not visible, so just try to walk along the pipeline. 100 meters further, you will be able to distinguish the path. 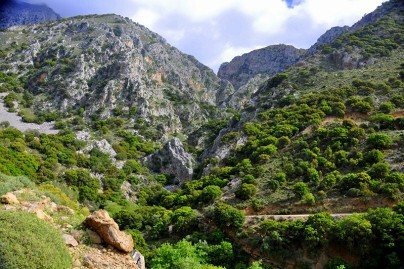 At this point, you begin to enter the gorge of Kavousi, where the path ascends to its top. 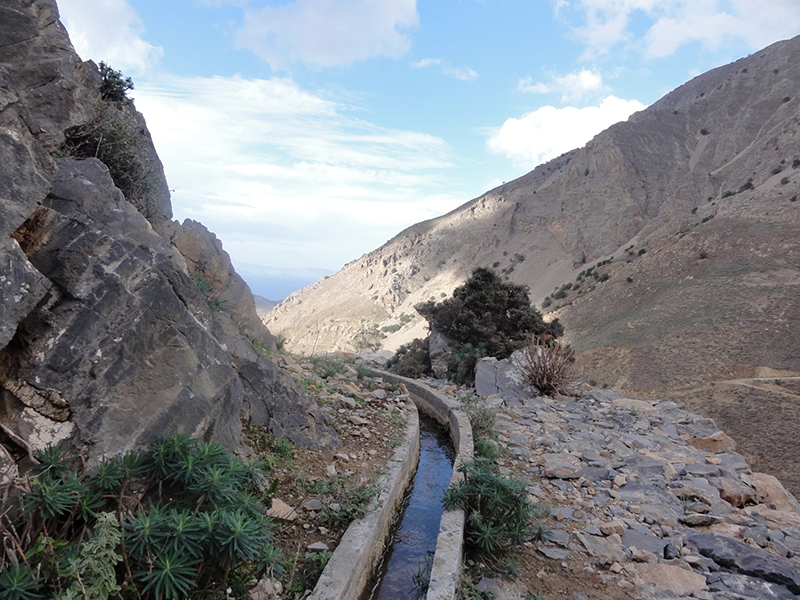 If you cross the gorge in spring, you will see running water in the pipeline, so you will be able to get a breath of coolness from its gurgling water. 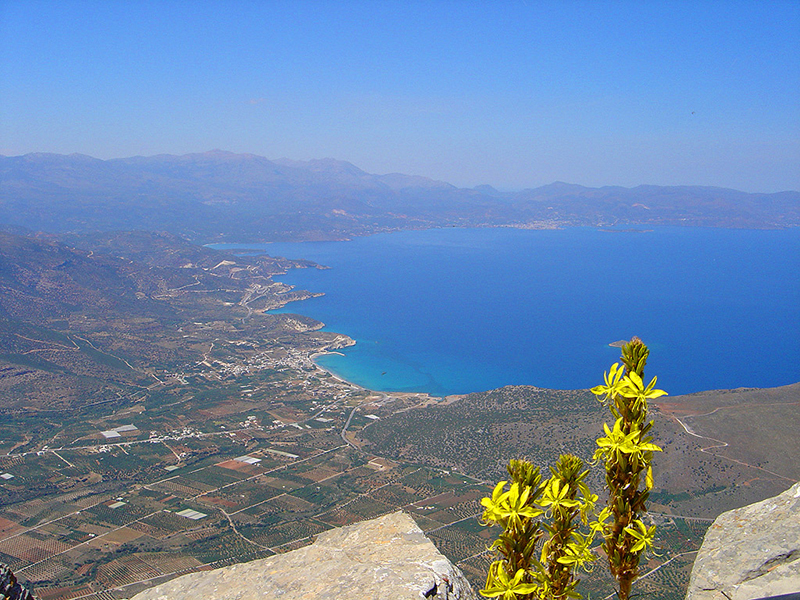 The trail climbs the steep slopes of the high rocks and offers you great views of the canyon, the mountains, but also to the bay of Agios Nikolaos (St. Nicholas). It will take you about an hour to cross the gorge. When you get to the top of the gorge, the concrete pipe continues until you reach a dirt road. You will need to walk about 15 minutes from the end of the canyon to the dirt road. 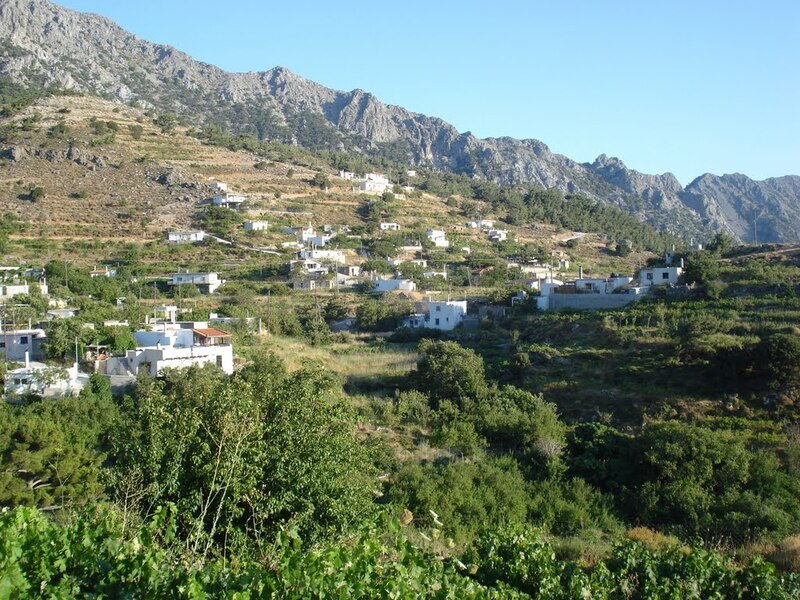 Turn right, westwards, and start walking the road that will lead you to the mountainous Platanias village after 45 minutes of uphill walking. From there, you are very close to Thripti village. Just continue to walk the dirt road without steep inclines now, and, in 15 minutes, you face the first houses of Thripti. Once you enter the village, take the right road leading to the western slopes of the settlement. In 20 minutes the road ends and you are right at the top of Papoura Mountain, at an altitude of 1020 meters, with absolute view to Ierapetra, Lassithi Mountains and the Gulf of St. Nicholas. When the weather is clear and there is good visibility, your view is breathtaking. The route from Kavousi to the top of Papoura is around 3.5 to 4.5 hours. If you return by the same route, it will take you about 2.5-3.5 hours. 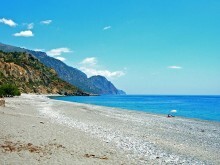 If you choose to return through the settlement of Platanias, you can take the road that takes you to Kavousi. We would recommend you to take the first choice and cross the gorge one more time, as it is one of the most beautiful routes for hiking in Crete! 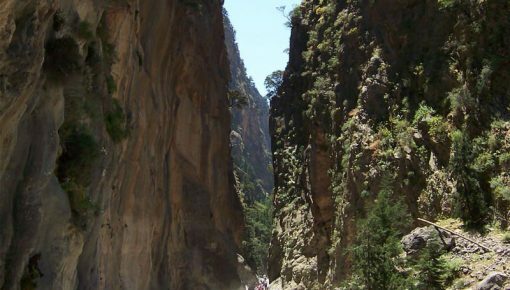 Read also “Top 10 Crete Gorges You Must Explore” . Posted on 28 Apr 2016 in Activities in Crete and tagged Cretan Gorges, Crete Nature, Hiking In Crete, Ierapetra, One Day Trips In Crete, Scenic Routes in Crete.